The Appellate Division of New Jersey’s Superior Court recently issued an instructive decision about arbitration agreements in employment law disputes. The case does not invalidate arbitration agreements – they are protected by both federal and New Jersey law – but it does show that the trend is that arbitration agreements are being construed strictly against the employers which drafted them. In the case of Amy Skuse v. Pfizer, Inc., the Appellate Division invalidated an electronic arbitration agreement used by Pfizer for all its employees. The “agreement” was not on paper, but an electronic “training module.” Employees received an email which instructed them to complete the “electronic training.” Even if they didn’t, complete the training module, the employees would have be deemed to have agreed to the arbitration provision by continuing to work for Pfizer for another 60 days. The module allowed them to scroll past the text of the provision, and did not provide for the employees to indicate their agreement to arbitration, only their “acknowledgement” of the policy. The module then thanked the employee for “reviewing” the policy, but not for agreeing to it. Amy Skuse was a flight attendant for Pfizer. She was a practicing Buddhist who as part of her religious beliefs objected to Pfizer’s requirement that flight attendants receive yellow fever vaccines because it contained animal protein. She had a “yellow card” waiver which allowed her to travel to any country without receiving the vaccine. She refused to take the vaccine. Pfizer eventually refused to accommodate her religious beliefs and fired her for not taking the vaccine. Skuse sued Pfizer in the Law Division of the Superior Court of New Jersey, claiming that she was fired as a result of religious discrimination, and that Pfizer refused to reasonably accommodate her religious beliefs. Pfizer asked the court to dismiss Skuse’s lawsuit and send the case to arbitration based on the arbitration “agreement.” The trial court judge ruled against Skuse, upheld the arbitration agreement, dismissed Skuse’s suit, and ordered the case to arbitration. Skuse appealed. The Appellate Division acknowledged that both the federal Arbitration Act and New Jersey’s Arbitration Act require the enforcement of agreements to arbitrate under general New Jersey state contract law, and that state courts cannot impose higher burdens on arbitration agreements than on other contracts. However, the Court noted that any contract in New Jersey in which a party gives up rights requires that the waiver be clear, unambiguous, intentional and unmistakable, which was certainly not the case here – indeed, this agreement didn’t even say that the employee “agreed”, and even if the employee clicked there was no way to tell whether the employee actually read and understood it. The Court also made short work of the provision which deemed that employees agreed to arbitration if they continued to work for the company for another sixty days or more. The court explained that this is not an unambiguous, unmistakable intention to arbitrate disputes and waive the right to go to court. Rather, it is a unilateral declaration by the company to bypass the requirement that agreements to arbitrate have mutual and unmistakable consent, as all contracts are required to have under New Jersey contract law. The court also explained that whatever the reason the employer designed the arbitration the way it did, “it still holds the cards by demanding assent from its workers as a condition of continued employment. If an at-will employee refused to agree to the policy, he or she can be shown the door….” Therefore, the Court followed the time honored rule of New Jersey contract law that ambiguities in a contract are construed against the party which drafted it – in the case of arbitration agreements that’s almost always the employer. 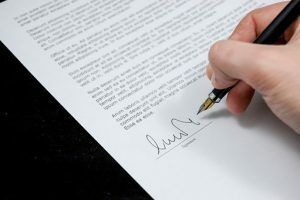 Thus, the employer needs to ensure that the agreement is clear, unambiguous, and demonstrates the employee’s unmistakable intention to waive her right to go to court and instead be bound by arbitration of all employment related disputes. We can help. Tagged: "New Jersey Employment Lawyers"